Crime and delicious food mixed with Camilleri’s writing will give you the Inspector Montalbano series. His dry humour will make you fall in love with the region. Known to be one of the greatest Italian writers of the 21st century, Camilleri’s alter ego i.e. Montalbano has been translated worldwide in over 10 languages. I have read a dozen of his translated works and also seen the TV series that propelled me to visit Sicily. (Read my post for The Local Italy here.) This is one series of books in Italy that you should read. A lot of people find his stories repetitive but that is the case with most of the writers I’d say. For those of you who have been following my blog since a long time know that I am learning Italian. I regularly do a series on Charming Italian Words and many words come from this beautifully researched book by Dianne Hales. This isn’t just a language book for her story which could easily be mine. La Bella Lingua which means the beautiful language includes phrases and history of the Italian language. It offers a lot more than just words and I cannot recommend it enough to anyone learning or curious about Italian. It also includes a great chapter on Dante and is a perfect book to read on Italy. I have already gushed a little about this book before over here and that defines my love for Rome. Four Seasons in Rome is lyrical and poetic and is the author’s personal account of his struggles in the eternal city. Oh Rome!! This book made me fall in love with the city yet again and whether one has visited or not, Doerr’s writing weaves a certain magic that will make you take that trip to the city! The Leopard was one of my first few reads on Sicily but it was nothing like I expected. Documenting Italy during the period of its unification or risorgimento, this book talks about class and traditions among the noblemen of Sicily. It is history and a bit of everything -politics, drama, aristocracy and power. A must read that easily makes it be one of the top 10 books on Italian Literature, The Leopard is also made into a movie. Did you see the movie Inferno?? Can’t stop thinking about the beautiful dome below?? You are not alone! Ross King’s book on Filippo Brunelleschi, the mastermind behind this dome, will make you fall in love with Florence. The book is intriguing and historical with a lot of engineering details. I enjoyed the story of the paranoid Italian goldsmith who is now one of the most famous names in the field of European architecture. His dome is not only the subject of many photographs but it is also what defines Florence as a city. Ross King’s book highlights the hardships that he had to endure in the times of plagues and wars and is definitely worth a read. I love Trieste and have always pointed out how underrated that port city is. It seems I am not alone in that thought as Jan Morris agrees with me 😉 Trieste and the Meaning of Nowhere was recommended to me by an Italian lady in a quaint bookcafe of Trieste. How coincidental! It is about the city’s troubled past and its moods and changeability. It is a book like no other because it portrays Trieste as a person more than a city. Morris who seems to be very attached to this city entwines humour and nostalgia. It would make perfect sense to visit the town of Trieste and then read the book but then again you could always read the book and then visit Trieste and understand its “nowhereness”. Another great book on Italy! Jhumpa Lahiri could easily be writing my very own account of learning the Italian language. Honestly, I didn’t know what to expect of this book when it first came but it completely took me by surprise. I devoured the book and recommended it to many Italophilies who in turn loved it. In Other Words is an honest account of her learning Italian and her story of living in Rome. Every time I read the book I find something new. As Lahiri says “When you live without your own language you feel weightless and, at the same time, overloaded. Your breathe another type of air, at a different altitude”. So true! You might have heard of The Neopolitan Series possibly everywhere online these days because people are trying to find out who “Elena Ferrante” is. But that is not why I read it. It started as curiosity and got me hooked to read the very gritty account of two friends and their life in Naples. It highlights Italian crime, politics, history and complex relationships in the most fierce and raw way you can imagine. Ferrante’s words are bold, effortless yet one that would make you cry. This book changed me in many ways and is a must read on Italy, especially for women. My very first book on Italy that has also been made into a successful movie, The Name of the Rose is a murder mystery set in the hills of Piemonte. It takes place in the Saint Michael’s Abbey which Umberto Eco had once visited in his life and chose to add it as a backdrop to his book. Since I don’t want to add spoilers and give away the story, I’d suggest to pick this book before starting anything else on Italy or Italian authors from this list. How can one list books on Italian Literature and not mention the genius Calvino?? That would be blasphemy! Invisible Cities is Calvino’s account of the travels and dialogues of Marco Polo and Kubail Khan. The book describes different cities with careful attention and imagination and includes city signs, prophetic warnings and human despair. It is a very hypnotic book and one that is not easy to read either but take it slowly and imagine the world of Calvino with all its eccentricity. I’d love to hear more books and “Italy specific” recommendations. Have you read any of these?? Disclosure: There are “ affiliate links” on my blog. If you click on a picture, it will take you to Amazon and if you purchase something through these links, I will receive a small commission (at no cost to you). Thanks for supporting my blog and keep reading Italophilia! How cool! I am checking it out. Yes this is a very basic must read list. I am going to post another one soon too. Thanks so much for compiling this list Ishita! I’ll have to check out that book on Trieste because I absolutely love that city! I bought one already (La bella lingua) and have another on the list (Lahiri), all thanks to you. 🙂 And I’ve recently read the entire Neapolitan series by Ferrante. It’s truly mind-blowing, and for everybody who has moved to Italy as I have, a bit revealing as well. Aww I am glad, cara. It is mind blowing and very very sad. Trieste and the Meaning of Nowhere is fabulous, and I just picked up The Leopard in a charity bookshop (50p!) so I’m glad it’s on your list. For light travel writing, I loved Vroom by the Sea, by Peter Moore. For deeper (read: more depressing) reading, Primo Levi’s “The Periodic Table” and “If This Is A Man” are both must-reads. Primo Levi’s books might belong to the “depressing” sphere but they are a must, especially If This is a Man. Once you read it, you won’t be the same anymore. I have only read one of his books and now I will be cautious before I pick up. I am in a short stories kinda mood these days. No don’t be cautious – he was a brilliant writer and thinker. There are so many light reads that I haven’t included in this post but will do in a separate post. Thank you so much. I am checking If This is a Man. I’m working on a translation of one of his other books (a collection of essays/articles) at the moment, so I’m going through biographies/interviews he conducted etc…. Fascinating man, and not many, if any, better 1st hand chroniclers of Holocaust history. Great list! I’ve read most of them. Am reading “In Other Words” now. If you haven’t read “The Sixteen Pleasures,” you should. It’s a fictional telling of the Florence flood in 1966 and the “mud angels” who came to help.. It’s one of my favorites. Thank you Kiki. I haven’t read that one..surely going to check it out. Just added everything to the TBR. Particularly Camilleri. I’ve been seeing hus books around and kept wondering where I’d heard of him. Now I remember. Haha. Great post as always! Haha 😉 Good thinking. He has a lot of books so start with the first unless you want to feel lost. Shape of the Water is the first one. I’ve got the Name of the Rose at home. great book! What a great idea this is. I love Doerr’s memoir. Have read all the Ferrante Neopolitan novels, and The Leopard. Can’t wait to read Larihi’s memoir, and you’ve given me some other great suggestions! Aww Valorie thank you so much.. your comments always encourage me. I will write another post too. Stay tuned! Such a wonderful book list. I am familiar with most and will definitely check out the others. I would humbly like to add my historical novel: “Bridge of Sighs and Dreams.” World War II Nazi-occupied Rome sets the stage for this drama based on real people and events. It is a story of betrayal, dignity, and purpose that highlights the brutality toward Italian citizens under both Mussolini’s Fascist regime and the Nazi occupation. My research included interviews throughout Italy in addition to translating documents and publications. The discovery of personal letters and journals augmented my study. The consistent manifestation of hope, scribbled across those abandoned pieces of paper, afforded a valuable glimpse into the Italian sentiment during this horrific period. I have not altered facts to fit my fiction; instead, I utilized truth to enhance my characters and their story. You can read more about the novel and Amazon reviews by clicking on “Fiction” on my WordPress site home page. I would be happy to hear any reader feedback. Saluti! Grazie mille. I hope you take the opportunity to read my novel and that you will enjoy it. Tanti auguri! Grazie Pamela. I definitely will, sorry my reading is so slow these days but I will definitely get to it. Hi Ishita, it’s Kelly from Instagram! I haven’t read any of these books yet, but I think this is pretty much my reading list from here on out lol! Some very interesting choices here, well done Ishita, you deserve honorary citizenship! Being a Piedmontese I’d like to suggest another couple of titles that, to me, are good testimonials of my beloved region. La luna e i falò, by Cesare Pavese, is one. Una questione privata, by Beppe Fenoglio, is another and, finally, Marcovaldo by Italo Calvino, possibly the one of the bunch I’m the most attached to. There used to be a great podcast/audiobook on Marcovaldo, narrated by a chap with a splendid Turin Piedmontese accent, the one that’s now almost completely disappeared… Nostalgia! Thanks for being so interested in our country! Hi there Ishita. I do think you’ll find Fenoglio translated in English, a bit less sure for Pavese, even though you’ll find him in French if you know that language. I am also a big fan of both Italo Calvino and Cesere Pavese. Great list. I’ve read several on it and appreciate the other recommendations. I enjoyed Under the Tuscan Sun by Frances Mayes and would highly recommend A Kiss From Maddalena by Christopher Castellani. You must read Camilleri. I’m a fan of Sicily even more so because of him.. happy reading Ferrante no 3 first. I can understand the dilemma of what book to start. I just started with Munro’s short stories today. Thank you for your great recos.. ciao ciao! Thanks Pamela. I have hard a lot about it apparently there is a movie too. I recently read Padre padrone, the book on which the famous film was based. A masterpiece in my opinion! And may I be so bold as to suggest my about to be published “Living in Italy: the Real Deal – How to survive the Good Life”. Ciao Stef! Call it a strange coincidence or meant to be (if you believe in these sort of things) but someone on my Instagram page recommended your book to me yesterday! Freaky, no? I am intrigued to read of your experiences and know how Italy was to you and Nico. It is very nice of you to message me here. I have seen your presentation as well as the book online. I was always a paperback person but off late started using the technology to make reading cheaper on the pocket and easy! Could you email me a PDF of your book?? I will look for the paperback online on Amazon India. Grazie mille, Stef. Buonasera da India. That was me! Glad to bring you two lovely Italophiles together. As for books on Italy — agree with you Ishita about di Lampedusa, Calvino and Camilleri. Afraid we part ways on Ferrante — I only finished My Brilliant Friend because it was for a reading group. Love Ignazio Silone, Primo Levi, Giorgio Bassani and my new favourite Antonio Tabucchi. As for authors who are Italophiles — Midnight in Sicily by Peter Robb is brilliant (particularly for good background on the Mafia); ditto Blood Washes Blood by Frank Viviano; Robb also wrote a biography on Caravaggio. Then just about anything by Tim Parks — fiction and non fiction. And finally for something that turns the whole ‘Under the Tuscan Sun’, ‘Eat Pray Love’ genre on its head there are three novels by James Hamilton-Patterson, starting with ‘Cooking with Fernet Branca’. Thank you Kathy!! I am glad you mentioned him 🙂 I am making a new post of more favorites from Italy and a few you mentioned are already on it 😉 So many more to read. Adding to my goodreads. are you on that portal?? Sorry for enterfering, but, as an Italian, I was impressed by your story. Did you really leave your country to open a B&B in the reign of impossible bureaucracy? Wow, you are a hero FOR REAL. Hands down. He is, believe me he is! Yep Ishita, I’m on Goodreads under my name. Your book sounds fascinating and your bed and breakfast is beautiful. Best wishes! Thank you so much for your recommendations. Having just spent another two weeks in the Veneto it’s like my second home. Also, I have been wanting to publish a post about books I like, but have been stymied by not having a vision of its organization. Now your post is a beautiful frame work. Thanks Richard for your kind words. Please do share your list. Where in the Veneto do you stay? I usually stay with friends in Budoia, a small town at the base of the Dolomiti and Piancavallo. Using Budoia as my base, I visit my friends also in Pordenone, Codroipo (UD), Farra di Soligo (TV) & Treviso. I love driving the Pedemontana. My next post well be about Italia and friendship. wonderful!! So glad to connect 🙂 grazie for the info. Just added it to my TBR <3 thank you and good luck! It is a great list Ishita. I have made note of several I would like to read when I return to Aus. Where are you 🙂 Thanks so much and enjoy yourself! Sorry for my absent mindedness. Have a nice time in NZ! I am sure, have heard wonderful things about the country. make the most of it! Yes I am:) love going through posts I missed or that are old. Thank you. Look fwd to it. Nary a work of serious history on this list. Paul Ginsborg’s 2 volumes on 19th and 20th century Italy are essential reading, as is anything by John Dickie. I may have missed replying to your msg. Sorry and thanks so much! How fun. Keep me posted on the towns you visit, I have never been there. Thanks — Grazie! Have read many light ones and a few of these. I look forward to reading more. Thanks for putting this list together. As you know, I took the plunge and bought a small farm here and do not regret it. These books Will be a good way to enrich the experience. Ciao rebecca!! Thanks for your comment. Wow fancy. Where in Italy? Have fun 🙂 Which one are you reading currently?? The Rome one. I got sick again, but more later. Good picks! I’m thinking of going to Trieste, myself. I loved The Name of the Rose (and Piemonte’s Sacra di San Michele is what inspired Umberto Eco, together with the Castel del Monte in Puglia), and Italo Calvino’s work is great too. I missed replying Diana. Just wanted to say how wonderful it was to meet you 🙂 Hope you are settled in the States now.. Did you visit Trieste?? I just wrote a post about Italian books that I want to read, and then I found this list. I’d love to hear your thoughts on any of the other books on my list if you’ve read them. You have given me a few extra books to add. How wonderful. I’m always looking for posts like those. N thank you! Can you share the link here pls?? I loved the Elena Ferrante series!!! me too Lisa. I was so sad when it ended. What are you reading?? You need to add Baudolino by Umberto Eco too. It’s another brilliant master piece of his! Philosophical meanings and history interwoven in one. Between Polenta talks and the real meaning of unicorns, I just couldn’t stop reading it. I compare it with the style to one hundred years of solitude from Gabriel Garcia Marquez. I think apart from Eat Pray Love, I have not read any book on Italy. 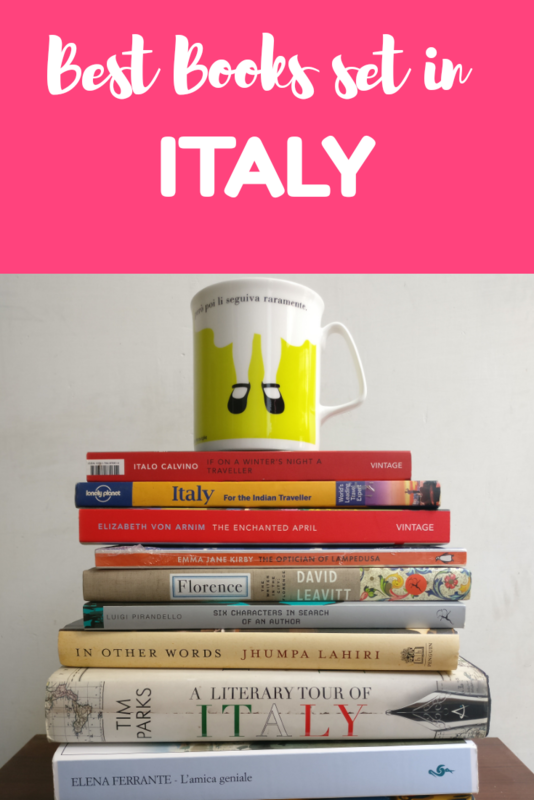 An unfair question, but which one of these books would you recommend if you had to recommend just one book from this list for an introduction to Italy. Just by the title – Seasons in Rome looks tempting. believe it or not, that would be the one I would recommend. And later after that, read Enchanted April. What a great list, You gave me a couple I have missed. Consider “Living In A Foreign Language” by Michael Tucker. It is an interesting and very funny account of an actor buying a home in Umbria, remodeling it, and his trove of friends that are part of his life. Grazie per il tuo blog.